Content marketing, when done right, is about giving something away – for free – sharing something with your audience that is useful and valuable for them. That's how you create an experience that your target audience will enjoy, benefit from, and look forward for more. Content is a leading element in 10 Digital Marketing Essentials to focus on in 2016. We all know that these days content is hugely valuable in our currency of marketing. How do you create a winning content plan for your brand? There are so many ways to use content to better market your products and services, to better connect to your target audiences, and engage consumers. Whichever way, whichever types of content you plan to create and share, remember that end-user value is critical. As far as the types of content you can or should create, see Content Marketing Strategy: What kind of content should you create. Overall, for your content strategy, read up on 6 ways to get Content Marketing done right. No matter how you plan, and what you aim for, you'll need to keep in mind that Customer Insights is your First Step in any form of Digital Marketing. This is particularly important for your content strategy. That's how you'll be able to work out what you need to 'give away' or share. Content marketing isn't a quick play game. It takes time for a brand that uses content marketing to build trust and to be recognized as a source of useful, valuable, enjoyable and reliable information. You need to become a go-to brand for your audience and stay top of mind and in their focus on a continuum. In real life for example, remember how you walked into a Home Depot to buy a box of nails to hang some new pictures, and the guy took a good half an hour of his time to show you the best way to hang picture frames? And you ended up buying a $45 hammer because that's how he got his nails in perfect? Now think of content as that half an hour of show and tell of How To content. Become a trusted, valued resource by giving away something. People like freebies. And I don't mean prizes and discounts (although discounts help somewhere along the conversion funnel). 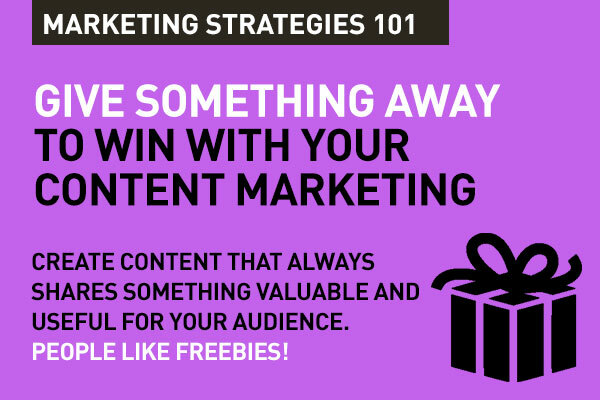 Giving something away means sharing content that is so useful to your audience that it really benefits them in their daily lives. That's beyond a price tag to that give away. And, that's what builds loyalty to your content, to your brand. Once you have audience and customer insights, you can plan on how you will add that value. Obviously, it will have to do with what your brand, your product, your service has to offer. For Coca Cola, it's built around their 'Open Happiness' theme. For Starbucks, it's not about their latte's but about the experience and those moments and how to get there, how to relax, how to, how to, what to... For Chevrolet, it's where you can go on a long drive, rather than fuel efficiency and horsepower. If you sell software, give away your 'mindware' – your knowledge. If your company repairs iPhones, put out short form videos and how to tips on common problems, and how people can fix it themselves. Sure, they won't come to you for that fix, but you're building trust right there. Educate your audience – become a resource. Gain authority and trust. You also might post on your blog, or create Facebook videos on neat hacks and How-to use all the features of the latest iPhone. Share unboxings that reveal hidden features. That's how you build leverage for the future. That's how your relationship begins. Make sure that when you create content that is useful, you make it shareable. When someone likes what you've given away, they will give it away as well. To their friends – and that's how your message, your brand gets around. Use all the right sharing tools for social. Empower your content for sharing the value you create. Not just about your brand, you can code-share. Useful, valuable content isn't necessarily built around just your brand or product. You should have the generosity of creating content that may involve other brands and bring your audience the benefit of a shared experience. In the airline industry it's called code-sharing. If you are Nutella, for example, your content could be about the Nutella with banana experience. Remember the Mentos and Diet Coke videos that went ape-viral? That was a shared content story. And Mentos got that totally right, Coke didn't. If your brand is a hospital, your content shouldn't be just about what to do in an emergency, or who's the best surgeon at your hospital. Create content on wellness. Sounds like counter productive to your business goals? If you were thinking of some really advanced surgery, wouldn't you immediately think of the Mayo Clinic? When you give, do not expect return. Or expect return right away. Content is not a QR code which someone redeems and you sell your product. Over time, you become a brand or a product that someone automatically should think of when they're looking for a genuine sellable solution that you can provide. Because over time, you've inched past being just another, to building a relationship by proving solutions every day. That's the pot at the end of the rainbow. Totally agree that good content is always about providing a value to the audience. Need to mention here that this value is not all about our own brand, but also on the overall need of the audience in that context of the product or usage. Nice point about code sharing. Brands are so reluctant to do that. On Snapchat, for example, brands oiften take part in other Stories, and that's such a great win on Snapchat. Some good points in this post. Today, content marketing is an essential part of overall marketing and social media strategy. Marketers are always wondering about the content that will improve their engagement and their brand loyalty with their customers. Good content is much more about what surrounds the brand conversation than about the brand itself. Good mentions on Starbucks and Chevrolet. Also important to note that many companies like Ikea produce not just useful content, but also entertaining, fun content that gets shared. Value can be entertainment as well. One more comment on this useful post: You did not mention useful content that is created (for free) by fans and followers. UGC is a very useful channel and a resource that a brand can use to build their overall content. Many times, UGC is better value content than brand content. Unboxings and hacks are great UGC examples.